WHEN: By reservation, limited availability. WHO: Caboose sleeps three, each bunkhouse room sleeps two. FURNISHINGS: Accommodations include fresh linens, shared bathrooms, and use of the bunkhouse kitchen. 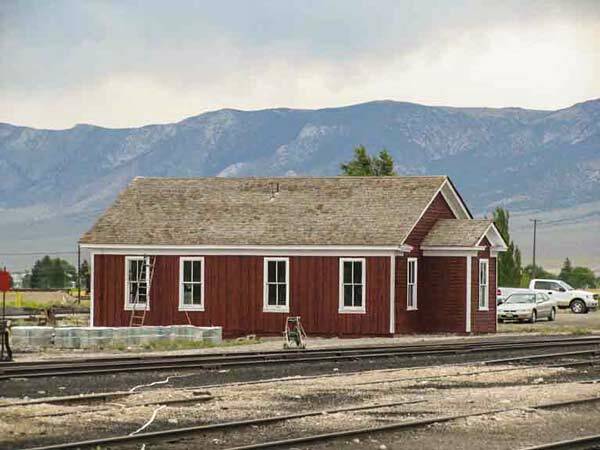 There are two options to sleep overnight in the historic main East Ely yard of the Nevada Northern Railway; the caboose or the bunkhouse. Both locations make great headquarters to witness all of the action in the yard. For example, If you return from a locomotive rental or one of our evening trains you will be dropped off just steps from your accommodations. Evenings up here are usually cool and clear. At night, the rail yard becomes eerily quiet. Soon all you hear is the hooting of the owl that lives in the coaling tower. As you climb into your bed you can imagine what it was like during the hayday of the railroad. The next morning don't be surprised to be awakened to the sounds of steam locomotives getting ready for the day. It only takes a minute or two to walk down to the engine house to take a look at what is going on. You're welcome to watch as the crew gets the locomotives ready for the day. At that point you'll probably be wishing that you had made reservations for the "Be The Engineer" experience. Advanced reservations are usually necessary, but double-check, just in case. 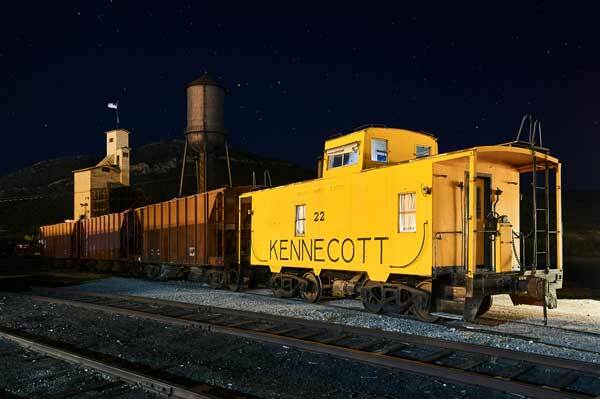 Caboose #22 was the last caboose delivered new to the Nevada Northern Railway. That was over 40 years ago. She was state-of-the art at the time with all-steel sides and roller-bearing trucks. Now caboose #22 is on special duty. You can sleep in her. Imagine ending your day by watching the sun go down from your caboose's cupola. You can picture what it was like for countless Nevada Northern Railway freight conductors and brakemen who have sat here watching the train as the miles roll by on the long-haul up to the Transcontinental lines to the North. Let's do a reality check on the caboose so you are not surprised. We have all seen an old caboose that is propped up on blocks and transformed into a cute little bed-and-breakfast inn. This is not one of those. Caboose 22 is still on the active freight roster. For your stay we will make sure it is spotted on a track that is close to the bunkhouse. Staying in #22 is great fun for a railfan, but it should be noted that it has much more in common with a stay in a RV without hookups than, say, a stay at a Ritz-Carlton. The caboose is clean and sturdy, but the creature comforts are rather thin consisting of single beds, clean linens and blankets. No electricity, no heat, no air conditioning (but not to worry, the evenings are almost always cool around here.) There is no running water in the caboose. Your shower and restrooms are located in the nearby bunkhouse. The bunkhouse is your second option. East Ely was never a large community. The railroad, mines and mill had a constant need for workers. To entice workers to the railroad, the railroad provided living quarters in bunkhouses. Today the museum continues this tradition with our restored bunkhouse. Built in 1906, it was recently remodeled to serve as a bunkhouse. Located in the middle of the rail yard, it is also used by volunteers and interns of the railroad. Now the general public has a rare chance to also sleep in the bunkhouse. Like the crews, the rail yard comes alive very early in the morning as locomotives move about getting ready for the day's activities. Now this bunkhouse has a little secret. This bunkhouse no longer has any bunk beds in it! Instead, you will have your own room with a nice queen-size bed or two twin beds. 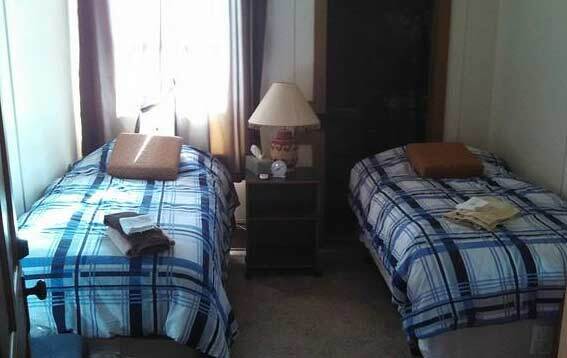 The bunkhouse has all of the modern conveniences - electricity, water, heat, four sleeping rooms, two shared restrooms with showers, a kitchen and a sitting area. Each room has a window air conditioner and heat panel. Prices below are per night, per room (for either one or two people). Check-in and check-out at the ticket window in the depot (1100 Avenue A Ely, NV which is at the end of E.11th Street, off of US 93). 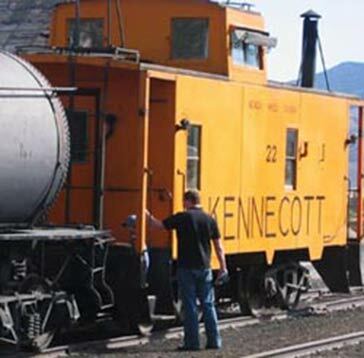 Check-In Time for either the Caboose or the Bunkhouse is between 3:00 pm to 4:30 pm. Monday through Thursday. Friday and Saturday check-in is between 3:00 pm to 6:00 pm and on Sundays check-in is between 2:00 pm to 3:30 pm. Please plan your arrival to Ely within these times, or call well in advance if you need to see if later arrangements can be made for you. Ely is in the Pacific time zone. Occasionally check-in time for the caboose may be delayed because it is out on a train and has to be made up for overnight service. Members receive discounts. Memberships start at only $30, and can use your membership discount for your train rides. No other discounts apply to Lodging. The current White Pine County Lodging Tax will be added to the prices above upon checkout.